An elegantly illustrated dove, created in an intricate, calligraphy ornament style, sits atop this upscale letterpress wedding invitation, evoking a feeling of peace and beauty. 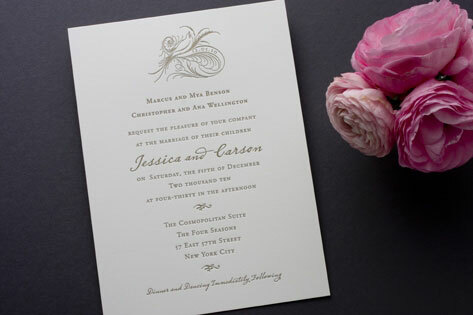 A bird in flight carries a note on the RSVP card, perfectly tying together this wedding invitation suite. Available in pewter (shown), burgundy, and silver blue.